Yerkes Observatory is an astronomical observatory in Williams Bay, Wisconsin operated by the University of Chicago Department of Astronomy and Astrophysics. It closed public operations in 2018. The observatory, which called itself "the birthplace of modern astrophysics", was founded in 1897 by astronomer George Ellery Hale and financed by businessman Charles T. Yerkes. It represented a shift in the thinking about observatories, from their being mere housing for telescopes and observers, to the early-20th-century concept of observation equipment integrated with laboratory space for physics and chemistry. 1897 photo of the 40 in (100 cm) refractor at the Yerkes Observatory. The observatory houses a 40-inch (102-cm) diameter doublet lens refracting telescope, the largest ever successfully used for astronomy, and a collection of over 170,000 photographic plates. Notable astronomers who conducted research at Yerkes include Edwin Hubble (who did his graduate work at Yerkes and for whom the Hubble Space Telescope was named), Subrahmanyan Chandrasekhar (for whom the Chandra Space Telescope was named), Russian-American astronomer Otto Struve, Dutch-American astronomer Gerard Kuiper, and the twentieth-century popularizer of astronomy Carl Sagan. Yerkes Observatory's 40 in (100 cm) refracting telescope has a lens produced by the optical firm Alvan Clark & Sons and a mounting by the Warner & Swasey Company. 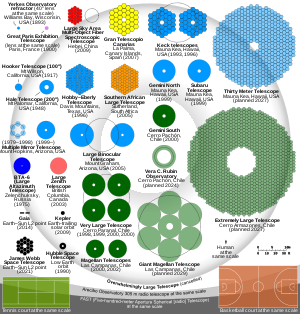 It is the largest refracting telescope used for astronomical research. (A larger demonstration refractor, the Great Paris Exhibition Telescope of 1900, was exhibited at the Paris Universal Exhibition of 1900.) The mounting and tube for the 40-inch (100 cm) telescope was exhibited at the 1893 World's Columbian Exposition in Chicago before being installed in the observatory. The grinding of the lens was completed later. The observatory also houses 40 in (100 cm) and 24 in (61 cm) reflecting telescopes. Several smaller telescopes are used for educational purposes. Both telescopes are available on Skynet Junior Scholars, and the 40-inch reflector helped pioneer the field of adaptive optics. Research conducted at Yerkes in the last decade[when?] includes work on the interstellar medium, globular cluster formation, infrared astronomy, and near-Earth objects. Until recently the University of Chicago also maintained an engineering center in the observatory, dedicated to building and maintaining scientific instruments. In 2012 the engineers completed work on the High-resolution Airborne Wideband Camera (HAWC), part of the Stratospheric Observatory for Infrared Astronomy (SOFIA). Researchers also use the Yerkes collection of over 170,000 archival photographic plates that date back to the 1890s. The past few years have seen astronomical research largely replaced by educational outreach and astronomical tourism activities. In March 2005, the University of Chicago announced plans to sell the observatory and its land on the shore of Geneva Lake. Two purchasers had expressed an interest: Mirbeau, an East Coast developer that wanted to build luxury homes, and Aurora University, which has a campus straddling the Williams Bay property. The Geneva Lake Conservancy, a regional conservation and land trust organization, maintained that it was critical to save the historic Yerkes Observatory structures and telescopes for education and research, as well as to conserve the rare undeveloped, wooded lakefront and deep forest sections of the 77-acre (310,000 m2) site. On June 7, 2006, the University announced it would sell the facility to Mirbeau for US$8 million with stipulations to preserve the observatory, the surrounding 30 acres (120,000 m2), and the entire shoreline of the site. Under the Mirbeau plan, a 100-room resort with a large spa operation and attendant parking and support facilities was to be located on the 9-acre (36,000 m2) virgin wooded Yerkes land on the lakeshore—the last such undeveloped, natural site on Geneva Lake's 21-mile (34-kilometer) shoreline. About 70 homes were to be developed on the upper Yerkes property surrounding the historic observatory. These grounds had been designed more than 100 years previously by John Charles Olmsted, the nephew and adopted son of famed landscape architect Frederick Law Olmsted. Ultimately, Williams Bay's refusal to change the zoning from education to residential caused Mirbeau to abandon its development plans. In view of the public controversy surrounding the development proposals, the university suspended these plans in January 2007. The university's department of astronomy and astrophysics then formed a study group, including representatives from the faculty and observatory and a wide range of other involved parties, to plan for the operation of a regional center for science education at the observatory. The study group began its work in February 2007 and issued its final report November 30, 2007. The report recommended creating a formal business plan to ensure the financial viability of the proposed science education center, establishing ownership of the proposed center before initiating plans for creating it, and forming a partnership between the University of Chicago and local interests to plan for the center. It also suggested that some lakefront and woods parcels could be sold for residential development. In March 2018, the University of Chicago announced that it would no longer operate the observatory after October 1, 2018, and would be seeking a new owner. In May 2018, the Yerkes Future Foundation, a group of concerned local residents, submitted an expression of interest to the University of Chicago with a proposal that would seek to maintain public access to the site and continuation of the educational programs. No successor operator had been identified by the end of August, and plans were put in place to close the facility on October 1. As of September 14, 2018 the University's talks continue with the Yerkes Future Foundation, but no long term plans have been announced by the University of Chicago for Yerkes Observatory after October 1, 2018. While public access will be closed after October 1, 2018 researchers will still be able to access the extensive historical glass plate archives at the site. Yerkes education and outreach staff have formed a nonprofit organization – GLAS – to continue their programs at another site after the closing. ^ Elizabeth Howell (August 15, 2014). "Yerkes Observatory: Home of Largest Refracting Telescope". Space.com. Retrieved December 15, 2015. ^ Starr, Frederick (October 1897). "Science at the University of Chicago". Popular Science Monthly. New York: D. Appleton and Company. 51 (May to October 1897): 802–803. Retrieved October 25, 2015. ^ a b Ley, Willy; Menzel, Donald H.; Richardson, Robert S. (June 1965). "The Observatory on the Moon". For Your Information. Galaxy Science Fiction. pp. 132–150. ^ "Field tests of the Wavefront Control Experiment". Adaptive Optics in Astronomy. 31 May 1994. doi:10.1117/12.176024. ^ Scott Williams. "Yerkes Observatory closing after 100 years on lakefront". (subscription required) Lake Geneva Regional News, March 7, 2018. ^ "New Group Submits Proposal to Keep Yerkes Open". www.chicagomaroon.com. Retrieved 2018-09-30. ^ "Yerkes Updates | Division of the Physical Sciences | The University of Chicago". physical-sciences.uchicago.edu. Retrieved 2018-09-30. ^ "GLAS EDUCATION". GLAS EDUCATION. Retrieved 2018-09-30. Description and history from the National Park Service.